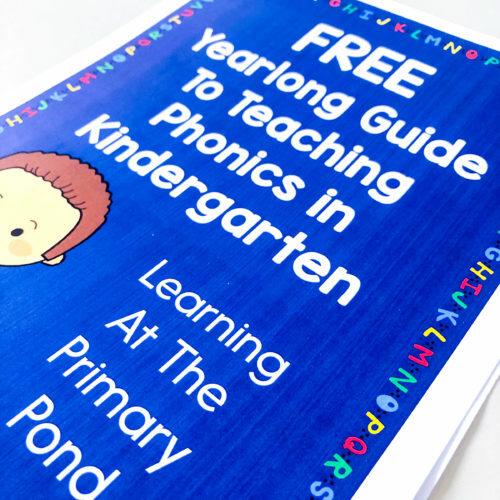 Teaching phonics in Kindergarten is unique because our students grow and change so much during the school year! As a result, the way I deliver my phonics instruction changes throughout the year too. So I wanted to share with you a “big picture” guide that takes you through the entire Kindergarten year, showing you how my instruction shifts to meet students’ changing needs. This post has a lot of info in it, so I also want to give you something you can take, print, and keep! Before you start reading the post, go ahead and grab the freebie by clicking the image below. It’ll be a great companion to the post and give you something to refer back to later! One important thing to keep in mind is that, while students tend to learn phonics skills in a predictable order (Bear, Invernizzi, Templeton, & Johnston, 2015), they don’t all learn these skills at the same pace. So although this is generally how I teach phonics throughout the year, I tweak this plan every single year, based upon my students’ needs. Again, this timetable will vary—and the content of what you teach may vary too! Every Kindergarten class is different; always do what’s developmentally appropriate for your kids. Next, I’ll go over each phase in more detail. I’ll explain what it looks like and what we’re working on. For the first 8-9 weeks of school, I teach several letters each week. We go through the letter name, letter sound, and how to properly form the letter. We also brainstorm words the begin with the target letter. We have a whole class minilesson each day, and then the kids have some type of follow-up practice. The follow-up practice might be a picture sort, a letter tracing/writing activity, or something along those lines. 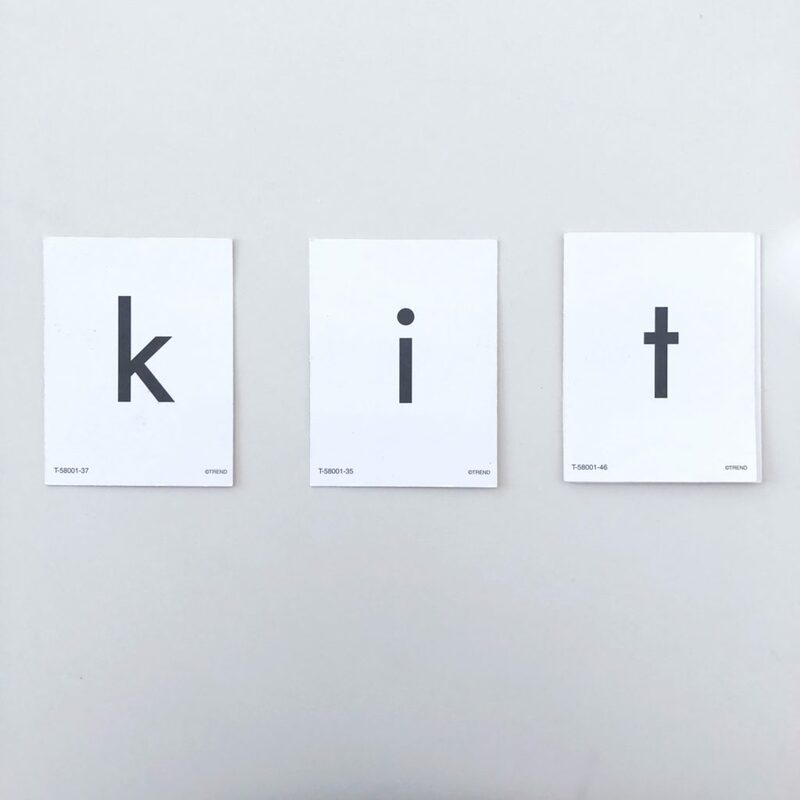 I do a couple of letters each week so that students who are ready can begin using those letters and sounds in their reading and writing as soon as possible. On the other hand, if I were to do one letter per week, it’d take 3/4 of the school year to get through them all. During this introduction phase, my goal is not 100% mastery of all letters and sounds by all students. I mean…that would be nice. 😉 But the point is to familiarize them with the letters, and then I follow up with differentiation during the next phase. If you have a Kindergarten class with a big range of needs (i.e., some strong readers and some kids who can’t yet identify the letters in their name), you might be wondering, “Is this whole group instruction a good idea?” And you might know that research has shown that it’s important to differentiate when teaching letters and letter sounds (Stahl, 2014). However, at the beginning of the year, unless you happen to have a class of all advanced readers, I think it’s important to make time for this whole group baseline instruction. Whole group activities at the beginning of the year build community and lay out a common foundation for the entire class. My students just aren’t ready to work independently, at least not for an extended period of time! If I put them in centers the second week of school so that I can pull small groups to differentiate my alphabet instruction, it’s probably not going to go very well. All students benefit from this “baseline instruction.” Even Kinders who are already reading might need to learn proper letter formation. Or they could use a review of the basic letter sounds before they move onto more complex sound patterns. Of course, even though we do these letter activities in a whole group setting, there’s still some built-in differentiation. For example, with the picture sorts that we do frequently, students can stretch out and write the word under each picture. Some kids may only get the first letter (if that). Others may be able to write the entire word correctly. Oh! I also want to mention that I actually start working with my students on CVC words during this first block of time. After 5 or so weeks of school, they’re going to know about 10 letters, including two vowels (a and i, if you use my scope and sequence, which is included in the freebie). That means that we can start blending! I display three letters and model how I say each sound aloud. Then, I blend the sounds together. After this, we blend as a class, and then I’ll have them try on their own. (I do – we do – you do). And since they know a few letters by now, we can start manipulating the cards to make different words! At this point, I’m not asking all of my students to read CVC words on their own. This drill simply familiarizes them with the blending process, and students who are ready for it will take off. Separately, we’re also doing a lot of phonological awareness work, because kids need to be able to blend 3 sounds you say aloud before they can read CVC words with much success. And although we do a little blending, the focus is still on learning the letter names and sounds (and other phonological awareness skills). So that’s the first chunk of the year! In the free download that goes with this post (see below), I included a suggested order for teaching the letters. At the end of this time period, I make sure to assess students’ letter knowledge so that I know how to differentiate my instruction as we move more into small groups. By now you’ve covered all of the letter names and sounds! At this point in the year, I shift to a little bit less whole group phonics instruction and a little more small group phonics instruction. I still think it’s very helpful to have some type of whole group review or teaching activity…but I keep it brief. During this time period, we typically review some of the letters that have been tricky for students. And eventually we add on digraphs (ch, sh, th, wh, ck)—although I wait until most students know most of the letters before throwing in digraphs in a whole group setting. We definitely work on digraphs in small groups—for those students who are ready, if any are ready at all! Speaking of small groups, I mentioned that my instructional mode for teaching phonics shifts at this point in the year. We start doing more small group work, and I differentiate as much as possible to meet students’ individual needs. The assessment data I gathered at the end of Week 9 helps me decide what letters students still need to work on. However, I don’t usually have dedicated phonics small groups. I usually integrate phonics instruction into guided reading/small groups. You can read more about what small group looks like for pre-readers in THIS POST. This next “block” of time is somewhat similar to the previous one, in that we continue to work on phonics mostly in a small group setting. Kids who are ready can begin doing some simple word sorts (in addition to picture sorts). 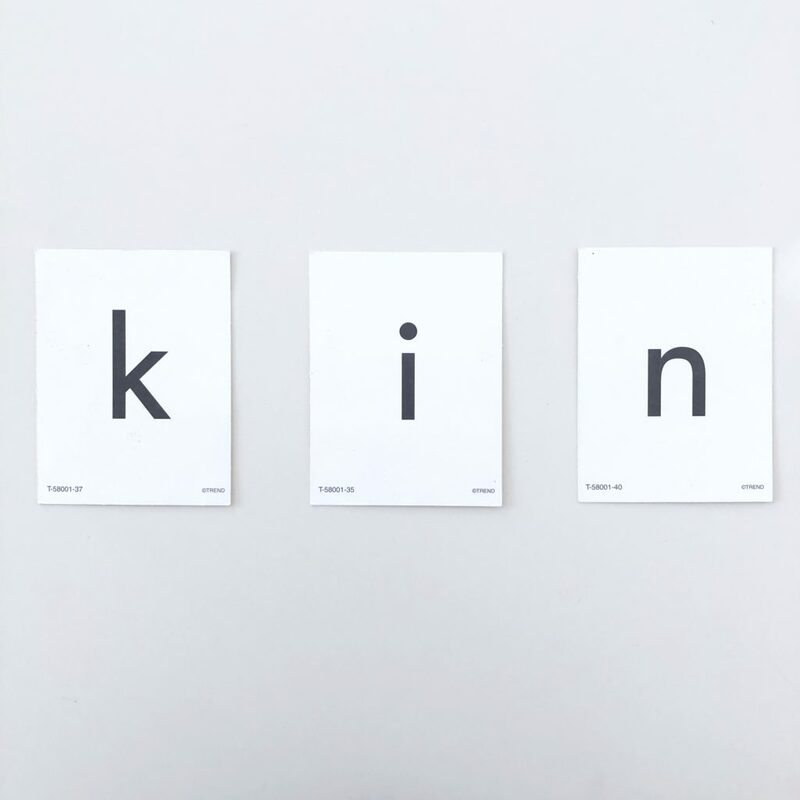 When we do quick phonics lessons in a whole group setting, I tend to focus on CVC words and word families, as long as most students in the class are ready for that. At the same time, some students are still working on letters and letter sounds, and that’s okay! (And on the other hand, some students may be far ahead, even working on long vowels.) That’s why I do most of my instruction in that differentiated, small group setting. Sometimes, depending on my schedule and the students, I start dedicated phonics small groups. These are separate from guided reading. It makes sense to do this if your students’ reading skills are really taking off and you need that guided reading time mostly for reading. Otherwise, you can just incorporate your differentiated phonics instruction into the small groups you’re already seeing. These last few weeks of school are kind of a medley of things! If I’m required to teach long vowel sounds to the whole group, I usually do this then. We also do a lot of review of CVC words, digraphs, and word families. Again, most instruction happens in a small group setting. 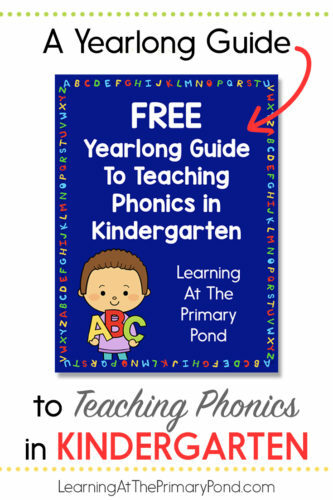 The thing about teaching phonics in Kindergarten—in any grade level, really—is that it’s going to vary from year to year. Although students’ learning usually follows that predictable trajectory, kids just develop at different rates. 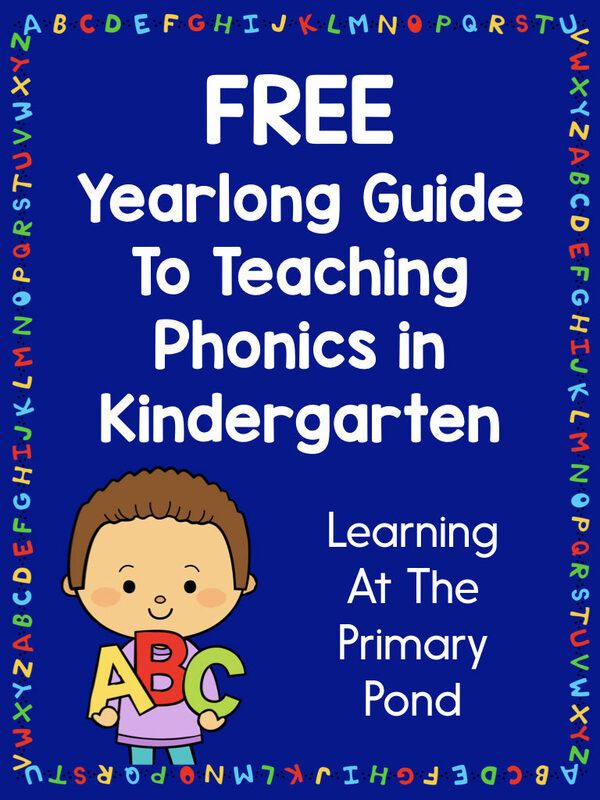 All the same, I hope this post was helpful in giving you a “big picture” look at teaching phonics throughout the year in Kindergarten! Don’t forget to download the freebie so you have this information for the future! Bear, D. R., Invernizzi, M., Templeton, S., & Johnston, F. (2015). Words Their Way: Word Study for Phonics, Vocabulary, and Spelling Instruction (6th ed.). Pearson. Stahl, K. K. (2014). New insights about letter learning. Reading Teacher, 68(4), 261-265.